It is very strange that the festive season is over and people have gone back to work already. My office is closed until next Monday which has worked out perfectly as we have had a hectic old festive season and so now I have a few days to relax, catch up on everything and get ready for that return to work. I have found that going away at the end of November actually made the festive season feel a bit less festive, I think it probably wasn’t helped by the fact that I had not prepared anything beforehand and we were then delayed a few days on our trip to Bali. Also work was crazy busy as we had a few absences and so the last week was a big catch up week. Christmas started at 12pm on the 22nd December for me when I finished work for the year. The Aussie and I were joined by Naomi and we headed off to the local mall where Naomi and I had our nails done, a photo with Santa and went to watch an early premier showing of Pitch Perfect 3 in between dinner with the Aussie. I loved the film and laughed through out, I would say it was better than the second film but the first film will always be my favourite. The day was a big infusion of Christmas all in one hit and just what was needed. On the Saturday I did my usual gym session and then popped over to our American friends house for some vision boarding in the evening. Altogether a lovely evening catching up with them both and their friend from Germany who is currently travelling around Australia and New Zealand. On the Sunday it was clean up the house day as we had guests arriving to stay, cooking sausages wrapped in bacon and chocolate brownies for Christmas lunch, present wrapping and some Miracle on 34th Street and Christmas with the Cranks viewing. The afternoon got super hot and as we have no air con in our house I suggested we go to the movies and watch the new Star Wars film and was glad the Aussie agreed it was a good plan. I quite enjoyed the movie (and the cool breeze!) though I am not a die hard fan really so I may not be the best judge of the film. Christmas morning we woke up at 4.45am to drive to the airport and pick up our friends from Darwin. We had a bit of a Nanna nap before heading over to our American friends for a pot luck dinner which was very nice indeed. It was a lovely day, albeit a tad warm with great company and a big cheer when it rained! When we got back home the possum came for a visit so I was able to show my family him/her when I called them to wish them a Merry Christmas. The day was topped of by being able to call and FaceTime with my mum and Grandma before crashing out in bed. Who knew Possums liked grapes? Boxing Day we went for a wander to the local mall for brunch and then Mel and I took a little walk around the shops to see what the sales had to offer. The sales were not that great to be honest but I managed to pick up a few new additions to the wardrobe. The rest of our Boxing Day was spent at home just relaxing, nanna napping and eating good food! I hope that you had a lovely Christmas Day and Boxing Day! Another week another installment of currently four! Reading – Administrative law textbooks which are as boring as they sound! Doing – I’ve been trying to break my weekends up with studying in the morning each day and then an activity in the afternoon. Yesterday morning I studied corporations (company) law which was quite interesting before an afternoon sailing and dinner with a couple who both have a birthday this weekend. This morning it’s been the administrative law study followed by going to see The 100 Year Old Man Who Climbed Out of a Window and Disappeared with the Aussie in a couple of hours. I tried reading this book last year but couldn’t get into it really but the film looks funny so I’m hoping we enjoy it. Unfortunately I will have to carry on the admin law study when we get home though. Watching – I need to watch the admin law lecture from this week this afternoon/evening. Have to say not looking forward to that. Hopefully will finish it in time to watch The Block which is currently one of my favourite programs. I think its the want to own a house in me! Listening – The Best Sixties Album in the World (their title not my description though it is pretty good). A lot of Sixties music reminds me of holidays with my parents and brother when we were at school, especially one where our dirty laundry was on a roof rack on top of the car and blew off! I heard a song on Friday night called Friday on My Mind and when I searched for it on iTunes the album came up on the list so decided to download it. It isn’t the best music for me to study with as keep getting distracted and “singing” along. Hoping – that if you like my blog you might pay a visit to the My So Called Chaos blog and vote for my blog in the Trusty Traveler category and for my Creamy Salmon Pasta recipe! I also saw some of my fave blogs are nominated Green Loving Girl, Rhyme and Ribbons, Misadventures with Andi, Cosmos Mariners, North and South Nomads, Snow in Tromso, An Unsettling Big Place, Love the Here and Now, Ember Grey – if you need some inspiration for the other categories! Moving into our own home has been quite the adventure. We’ve had the “fun” of hunting for furniture (after a day of hunting for a sofa/sofa bed I soon lost my shopping for furniture excitement) plus the moving and packing of course. 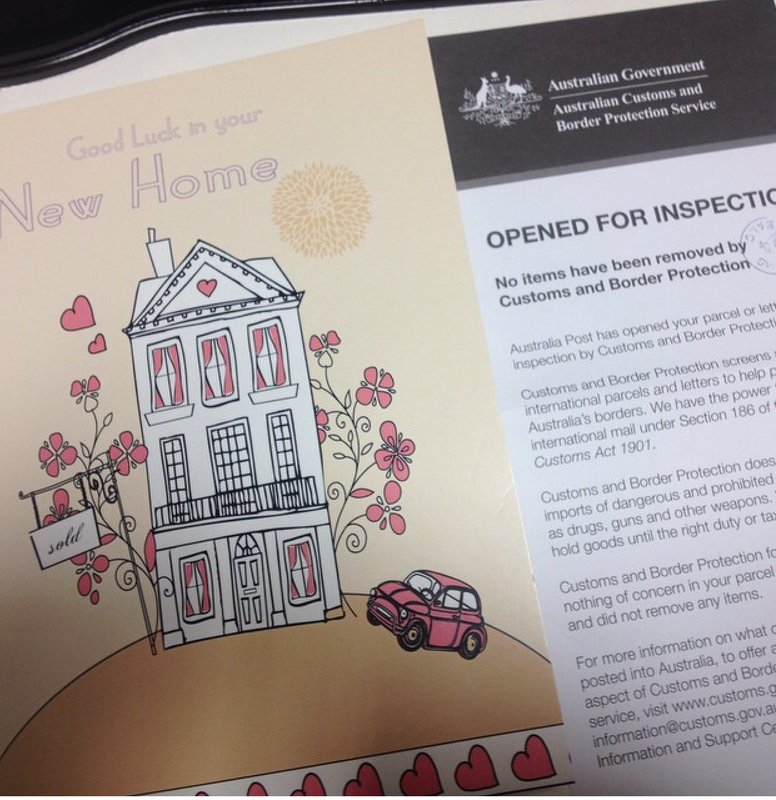 It was extremely entertaining to receive a moving home card from my parents and discover that it had been opened by Australia Post on behalf of Customs because immigration were concerned that it might have banned material! It’s also been lovely to receive lots of offers for help including being lent a ute to move our stuff, people giving up and offering their time to move bits that are too heavy for me to lift with the Aussie, offers of furniture as well as being lent a TV which I’ve just set up in the living room today. My parents have sent us some money to buy lots of handy things for the house (I’m hoping to have a few blog posts because of the things they’ve paid for as well) which have been so so helpful especially when money was a bit tight. 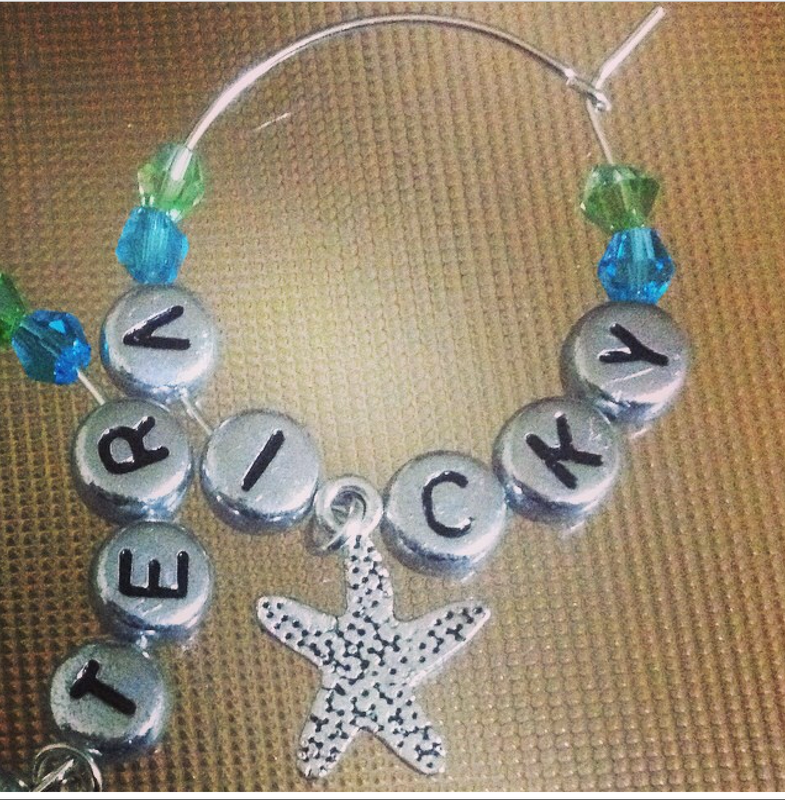 I’m quite excited to use our new wine glass charms which were a gift from my neighbour in the UK who also met an Aussie who she is married to and lives with her hubby and her son in West Australia (we really need to plan a visit). We had very short notice to find a new home and were lucky to find a great apartment in the middle of the city at a good price but then to see lots of people in our lives offering their time, support and other things to help us has been a lovely thing for us both. So not only is it fantastic to have our own home in the city but it makes you feel very grateful to be surrounded by family and friends likes ours and lucky too so I’m going to join the Grateful Heart link up on Emily from Ember Greys blog as it’s a week long link up.